Bows of violins, violas, cellos and other stringed instruments can have hair issues: The horsehair bows fray, break and need fixing. It’s the nature of organic material. Fine violin bows (as well as fine cello bows and viola bows) are a bit of a menagerie. There’s the frog of course, which isn’t at all derived from real amphibians, plus horsehair, the most important part. And tucked inside frog mechanism is the abalone slide, made from a real mollusk. This last piece, the thin rectangle of iridescent purple and turquoise, is almost too pretty to hide inside the frog. It is in fact the same material known as Mother of Pearl used in jewelry. But the hardness of abalone is part of why it’s used in the vise-like mechanism in stringed instrument bows ­– along with several other precision parts – to hold the horsehair in place. That said it’s the horsehair that gets most of the attention. This is partly due to it being visible and also because the vibration of the hairs sliding or striking the actual instrument strings produce the sound. Any violinmaker will attest that even the best Stradivarius violin is only as good as its bow, a powerful statement on the bow’s importance. But bows fail and need repair – frequently. Active players might have their bows repaired and rehaired every six months. The reasons for this are sometimes obvious – broken bowhair mid-concert! – or very subtle. The horsehair stretches and breaks, or just fails to engage with the instrument’s strings to produce an acceptable sound. • Broken hairs that are unevenly distributed, such as all on one side. This might be due to how you play or uneven bow tension, but either way it needs fixing. • Frequent hair breaks, which might be about a bow-instrument mismatch, or the player is trying to force a sound (too firm a grip and pressure on the strings) that isn’t there. • Seasonal weather conditions, or travel to a different climate, can affect the humidity and relative dryness and length of the bow hair. The dryer the conditions, the shorter and therefore more tense the hairs – perhaps too tense, leading to breakage. • Bow bugs, the tiny mites that love dark places (inside cases) and the taste of horsehair, can destroy the bow hair in a few short weeks. Sunshine can go a long way to scare them out of a case; hair damage still needs to be addressed. • Accumulated dirt on the hair, from human hands and sweat or the rosin and ambient dust, can compromise the horsehairs as well. Clean with a soft, clean dry cloth is recommended; veteran violinmakers often advise that detergents and solvents can cause more harm than good. 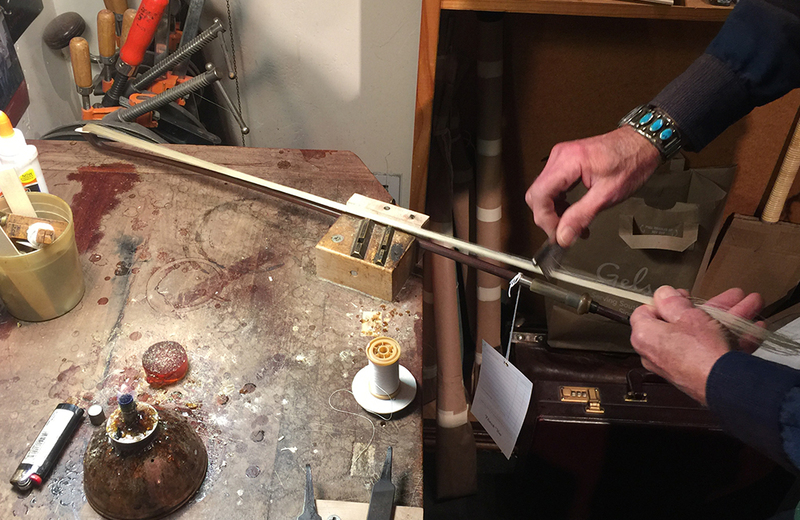 With the cost of a simple rehair priced at only around $65, players are urged to take their underperforming bows in to a violin shop for examination and a repair. It just isn’t possible for the individual musician to do it at home. The proper workspace and tools are required, not to mention the expertise. With frogs, horses and abalone already involved, it’s quite all right to hand the job over to a professional.